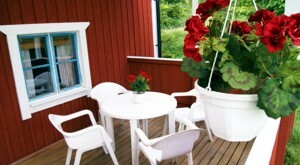 Our 80m² big fishing cottage with 5 beds sits atop a hill above the zander lake Stora Nätaren. It's about 280m to the lake as the crow flies, so you can see lake Stora Nätaren from certain spots on the premise. The lakeside cottage in Sweden was built already in 1804 and has been highly modernized during the last years. 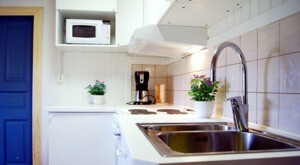 The result of the renovation is a good compromise between modern equipment and historical charm. Our cottage has a well-equipped kitchen, TV with international channels, internet access with WLAN and 2 bikes at your disposal if you want to explore the area around the cottage. Please take a look in our photo gallery so you can see for yourself. 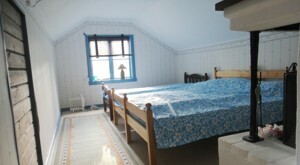 All photos of our cottage can be found there in a larger format. The cottage isn't located right on the lake, but on the other hand you hardly have any neighbors. The only other house within a range of 1 kilometer is that of your landlords Göran & Iréne and their house is still about 120m away from the cottage. 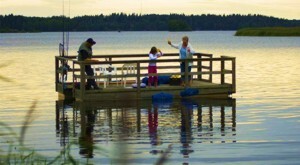 The lake Stora Nätaren at our fishing cottage in Sweden is a real insider tip when it comes to zander fishing. We can get you everything you need, from the necessary fishing permit, to renting different boats and you can even hire a local fishing guide if you wish. 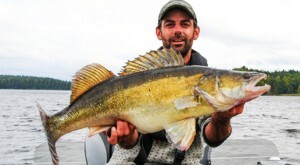 Download a depth chart of the zander lake Stora Nätaren here. The bedroom of the cottage with its big and comfortable double bed guarantees you relaxing nights and mornings during your stay. Charming details such as an old stove (not in use) and decorated chairs help create a pleasantly rustic atmosphere. The big children's room with a second double bed and an extra single bed gives you plenty of room for family and friends. 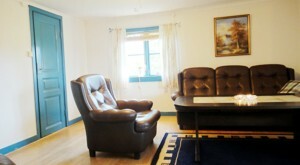 The room gets its special character from a big open fireplace located right by the door. 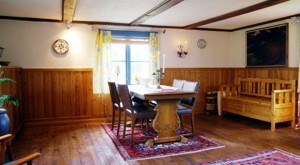 The well-equipped kitchen of this cottage in Sweden has a dining table for 5 people and is located downstairs. You'll find everything you need for cooking here: refrigerator, freezer, a stove with 4 stove plates, oven, microwave, coffee machine, toaster, cutlery, plates, pots, pans, glasses, bowls and more. Round off your evening after exploring the surrounding nature in this cozy dining room. After a long day of fishing on the zander lake Stora Nätaren, you can heat up next to the fireplace, comparing and evaluating your catches of the day in this relaxing atmosphere. Downstairs next to the kitchen and the dining room with a big fireplace you'll also find the bathroom with a shower and the living room of the cottage. The living room has a DVD player, a new flat screen TV and through satellite you can view international TV channels from our cottage in Sweden. Right beside the entrance of the cottage, the small roofed terrace allows you to enjoy evenings barbecuing with the whole family without letting the occasional Swedish summer rain disturb you. Whether a beginner or experienced with zander fishing - our local fishing guide Henrik Olsson increases your chances of a getting a big zander, pike, perch or char, adjusting the experience to your knowledge and wishes. Aboard Henrik's well-equipped boat you'll have everything you need including fishing gear, echo sounding device, and coffee. We also offer to intensively teach our guests new methods like pelagic vertical jigging for big zander & pike or vertical speed jigging for char. If you are interested in learning a new method we suggest that you allow for sufficient time and book at least 3 full days. For prices see our price list. Questions? Give us a call, , daily 15:00 - 22:00. The days marked in red in the booking calendar are already booked by someone else. Please choose one of the vacant periods. 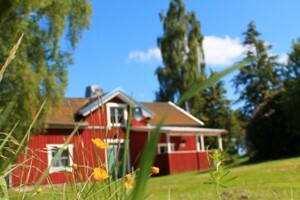 If our fishing cottage at the lake Stora Nätaren should already be booked please see if our other cottage in Sweden at Stora Nätaren is still available or take a look at the booking calendar of our other lakeside cottages in Sweden or our seaside cottage in Stockholm. Prices apply in Swedish Crowns (SEK) for one full week from Saturday to Saturday. Higher prices may apply to stays shorter than one week and arrivals or departures on days other than Saturday. There are NO HIDDEN COSTS! 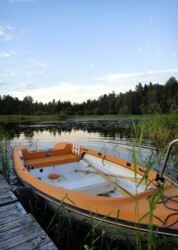 A row boat, water and 200kWh of electricity are included in the weekly rent. Please bring your own bed sheets and towels and clean the cottage yourself before your departure or book the according optional services. The prices given in EUR are quoted from Yahoo Finance and are only made available for your orientation. We take no responsibility for the rate used and the accuracy of the EUR prices. Currently you get about 0,10 SEK for 1 EUR. * The prices given in EUR are just for your orientation. We take no responsibility for the rate used and the accuracy of the EUR prices. ** Price per boat. The boat of the guide comfortably fits 2 guests at the same time. We recommend splitting the 10h full day fishing trip between 4 guests, which lowers the price to 1.125 SEK per person and gives each guest the opportunity to fish with the guide for 5h. During July and August it's crayfish season for us - we like taking our guests in groups of up to 9 people crayfishing and afterwards we invite you to a typical Swedish crayfish dinner ("kräftskiva") and an evening full of good atmosphere and high spirits. This will definitely be an unforgettable experience for the whole family! Arrival on Saturdays after 3 pm. Departure by agreement but at the latest on Saturdays 10 or 12 am. Pets are not allowed in this cottage. 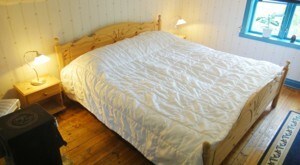 Please take a look at one of our cottages suitable for holidays with your dog. Other periods, arrival & departure days or times are only possible on request. Bed sheets can be rented on request, but please bring your own towels. Smoking is not permitted in our fishing cottage! You can still smoke outside the cottage, but we kindly ask you to gather the cigarette butts in an ash tray. Please note! You have to clean the cottage before departure and leave it just as clean and neat as you found it or book a final cleaning from us at your expense. When getting the cottage key you leave a deposit of 150 EUR which you get back after cleaning the house and handing over the key. Instead of using the form above you can also send an email with your booking request to: Please make sure not to forget your name, address, the house you are interested in and the desired period so we have all the details needed to process your booking. If you have any further questions feel free to call us between 15 and 22 pm on our German landline number . In case we don't answer straight away please leave a message with your name and landline number on our answering machine. We will gladly call you back - during the afternoon it often only takes a few minutes. You can't see the email address and telephone number written here? To make them visible please enable Java Script for www.jonkoping.de and www.sommerhaus.se!